about the Grand Coulee Dam by the NBC Today Show. of Seattle, and 80 miles South of the Canadian Border. Welcome to the Grand Coulee Dam Area! Try your luck at fishing the many lakes and rivers. (open all year round) Take a nature walk, or hike on one of over a dozen scenic and historic trails. You'll find The Grand Coulee Dam Area has plenty to offer! Wildlife & Bird Viewing, Nature Walks, Hiking, Camping, Photography, Hunting & Fishing & lots more !! Spend the Day and Experience the Wonder of the Coulee! Come to the Coulee & see what you've been missing ! Fish any or all of our 'Open Year-Round' lakes... to take home a few 'Nice Ones' this weekend !! or just taking a drive or hike to do some Bird Watching and viewing of other local wildlife. only a little over 3 hour drive from the West Side !! 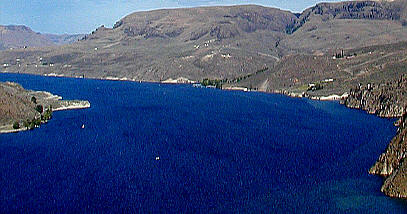 Now is a great time to visit the Grand Coulee Dam Area !! Water ??? We've Got Water !! backed up behind Grand Coulee Dam. up to a useable level for the summer. drought, come to Lake Roosevelt !! "We've Got Water." l All NEW Laser Light Show! - Starts Nightly for the Summer on Saturday, May 26th 2018 !! New Exhibits & More makes this a MUST SEE !! Begins again April 2018 - Call the Visitors Center at 509.633.9265 for more info. Eastern Washington's best kept secret getaways.